Harker middle school students had a great showing at the Santa Clara Valley MathCounts competition on Feb. 10, winning the team event and setting a new Harker record with four students earning perfect scores. In individual competition, eighth graders Alexander Hu, Mark Hu and Rishab Parthasarathy and seventh grader Sally Zhu all had perfect scores of 46, tying with 11 other students at the event. 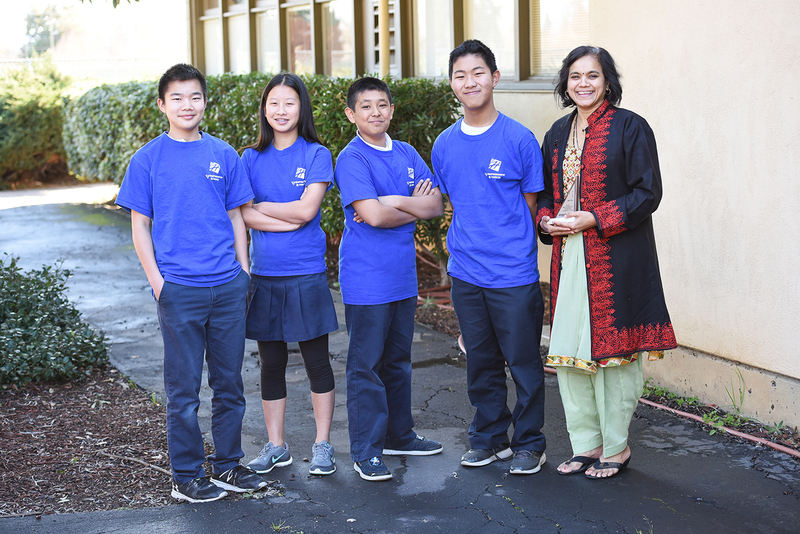 Such a result demonstrates the level of competition in the Santa Clara Valley chapter, which “is known to be the toughest chapter for MathCounts in the country,” said middle school math teacher Vandana Kadam. The contest went to a tie-breaker, from which Parthasarathy emerged victorious. Connie Jiang, grade 7, was among the 15 students who tied for second place, and won the tie-breaker round to officially take second with 45 points. Grade 8 students David Dai, Rohan Thakur and Kevin Wang, as well as Riya Gupta, grade 7, placed in the top 25 percent at the event, which featured more than 400 competitors from 46 schools. The team of Alex Hu, Rishab Parthasarathy, Sally Zhu and eight grader William Zhao won the team competition by a slim margin, inching past Miller Middle School by just a quarter of a point. This victory advances the team to the state competition, to be held March 31 at Stanford University. Due to their performances in the individual event, Mark Hu and Connie Jiang also advanced to the state level. Qualifiers from the state competition will travel to Washington, D.C., for the MathCounts National Championship in May.